No Life Guard on Duty is a graphic depiction of every day life. 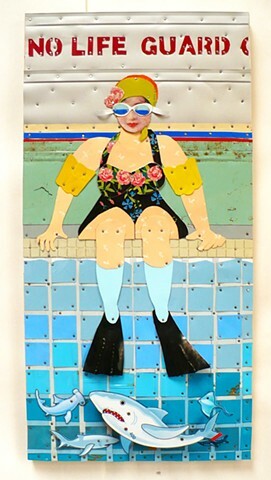 She is all set for a swim in a public pool, goggles- check, flippers- check, bathing cap- check, water wings- check and even though she is well suited up there are sharks in the pool and no one on duty to save her. This is what life is about to me because you never know what is waiting out there for you.